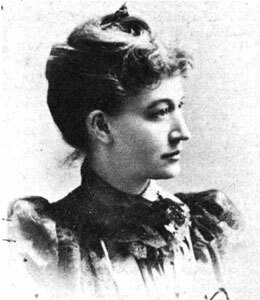 Lizzie Crozier French, organizer of the Knoxville Equal Suffrage Association, president of the Tennessee Equal Suffrage Association and the Tennessee Federation of Women’s Clubs, and state chair of the National Woman’s Party, was one of five daughters born to John H. and Mary Williams Crozier. A civic-minded Whig attorney, John H. Crozier represented Knox County in the Tennessee House (1837-39) and served in the U.S. House of Representatives (1845-49). Lizzie Crozier was educated at the Convent of the Visitation in Georgetown, then at an Episcopal female institute in Columbia. In 1872 she married William Baxter French, a grandson of presidential aspirant Hugh Lawson White. Unfortunately her husband died eighteen months later. She never remarried. Eleven years after her husband’s death and with aid from sisters Lucy Graham Crozier and Mary Hume Crozier, French opened and directed the East Tennessee Female Institute. An enthusiast of education for women, she founded Ossoli Circle, named for feminist and transcendentalist Margaret Fuller Ossoli, in 1885. By 1896 her interests had spread to the needs of working women, leading her to establish the Woman’s Educational and Industrial Union. During the second decade of the twentieth century, the movement for woman suffrage in Tennessee developed into a statewide coalition. French worked diligently on behalf of woman suffrage, rejoicing when Tennessee became the pivotal state in ratification of the Nineteenth Amendment. She ran unsuccessfully for city council in 1923. Lizzie Crozier French became ill while attending the Baltimore Conference of the National Woman’s Party and died on May 14, 1926.